ANUSA will seek methods to achieve diversity in the Executive and Presidency in a working group to launch this break. The outcomes will be decided by the community, President James Connolly said, but he would not rule out affirmative action. 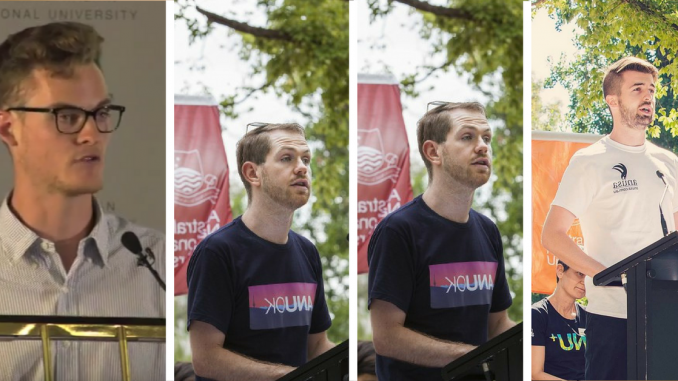 White men have held the ANUSA Presidency for several years, a fact Connolly emphasised, saying, “in my entire time at ANU there has not been a female president.”. 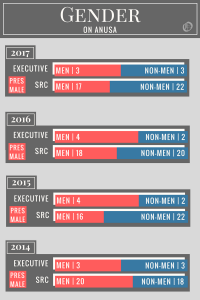 The last female President of ANUSA was in 2013, and there were no female candidates for President in last year’s election. Methods for increasing diversity will be discussed at open meetings and through a public submission form. Connolly mentioned mentoring and affirmative action as possible solutions, but promised the process would be led by ANUSA’s Department Officers and decided upon by students. “As a white man,” Connolly argued, “this isn’t a conversation I can lead, but as President it’s a conversation I can facilitate.” He said that if students “overwhelmingly” want to promote diversity through affirmative action in voting structures, he would support their views. Any change to voting regulations would require a vote at a General Meeting, open to all students. Connolly argued diversity was a concern of corporate governance, not just equity, and that the institution suffered if “the CEO” was consistently of the “same life experience and background”. Furthermore, he presented that without diversity on the Executive, especially for the President, it became difficult to advocate for issues concerning women and other groups to the University. Connolly said the program will take into account the dimensions of gender, ethnicity, sexuality and socio-economic status. Barriers to minority groups can be addressed “at every event, not just election time”, said Indigenous Students’ Officer Makayla-May Brinckley. She explained that Indigenous students may feel unwelcome in the Association due to a lack of Acknowledgement of Country, and through wider financial and social barriers beyond the Association’s control. Through removing barriers, Brinckley argues, students will “feel comfortable” engaging with the Association “by the time elections come around”. Changes, initiatives, or campaigns would be implemented after the 2017 election. ANUSA will hold several meetings during the winter break to discuss options, then pause proceedings until after the election. Connolly said this is so the process does not affect voting.